Wise Registry Cleaner is one of the safest Registry cleaning tools available in the market today. 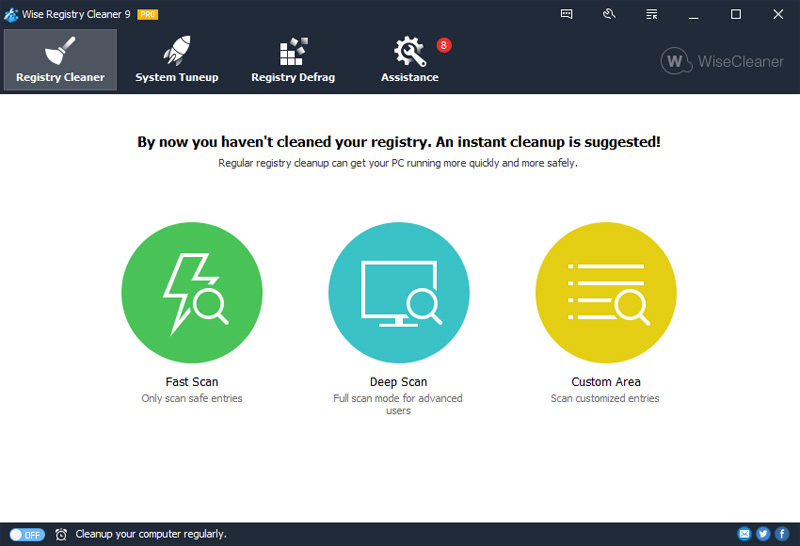 Its scanning engine is thorough, safe and fast.It is so easy to use,even the least experienced user can easily repair registry with this tool.It scans the Windows registry and finds incorrect or obsolete information in the registry. By fixing these obsolete information in Windows registry, your system will can work better and more quickly.After Wise Registry Cleaner analyzes your system for problems, you can individually view each of the problems found and call up a detailed description. If you wish, you can also have all problems corrected automatically.All changes to your system are monitored by Wise Registry Cleaner and can be undone with a few mouse clicks, so you can use Wise Registry Cleaner feel relieved. Changes: 1, Updated various translations. 2, GUI and usability improvements. 3, Minor bug fixes. Wise Registry Cleaner and Wise Disk Cleaner, a pair of affordable Windows applications that stabilize your computer, and make it run more quickly. "Wise Registry Cleaner" means complete software package from Ancodia software including installer, application itself, any related documentation, multimedia content (such as animation, sound and graphics), all related updates, and all included files supplied by Ancodia software. Wise Registry Cleaner is not free. It is distributed as shareware and it is copyrighted by WISECLEANER.COM. Wise Registry Cleaner can be freely distributed and included in any free or commercial package without WISECLEANER.COM's written permission as long as it is not modified in any way and there is no charge for it. Wise Registry Cleaner may not be distributed for profit in any form, including, but not limited to, electronic information service distribution, bulletin board distribution, user groups, online services, redistribution companies, and magnetic or optical medium distribution, unless explicitly stated in writing and signed by the WISECLEANER.COM. Non-profit distribution of Wise Registry Cleaner is permissible without prior written notice, providing that Wise Registry Cleaner is not modified in any way, and the complete works of Wise Registry Cleaner are included in the distribution package. END USER LICENSE AGREEMENT ============================================================ PLEASE READ THIS END USER LICENSE AGREEMENT ("EULA") BEFORE USING THIS SOFTWARE. BY USING THIS SOFTWARE, YOU ARE AGREEING TO BE BOUND BY THE TERMS OF THIS LICENSE. IF YOU DO NOT AGREE TO THESE TERMS, PROMPTLY CEASE ALL FURTHER INSTALLATION OR USE OF THE SOFTWARE.